It brings great amount of joy when the little things you do gets appreciated, may it be even a complimenting look and such an email from the Kerala Tourism board is definitely a new year gift that I shall cherish! I am proudly adding the three mind-blowing aerial view pictures of the Enchanting Backwaters that Kerala Tourism has mailed me! Enjoy and do make sure you are in the God’s Own Country soon! 🙂 By the way, if you hear Kerala calling then dont forget to check here before you leave http://greatbackwaters.com/ 🙂 Trip On! On the coast line caressed by the Arabian Sea and on a land where canals and waterways twine to form the breathtakingly beautiful backwater lagoons, lays this charming city dubbed as the Venice of the East. 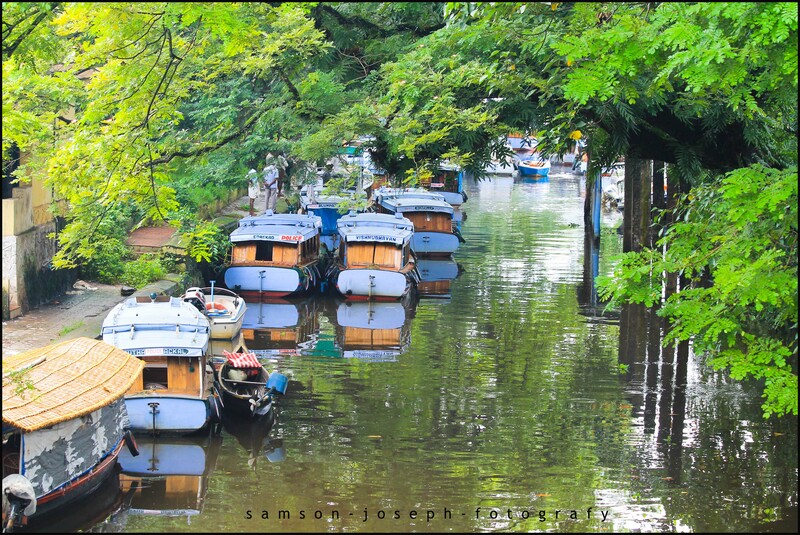 Alappuzha a.k.a Alleppey, the smallest district in the state of Kerala is arguably the face of tourism in Kerala and sometimes even of the Incredible India. This exceptionally beautiful town is boasted for its houseboat tourism on almost every travel brochure on India. With its lush green paddy fields, rows of tall coconut trees, laid back villages and interconnected waterways, Alappuzha charms and delights its visitors at every scene. All these make a festival for the shutterbugs. 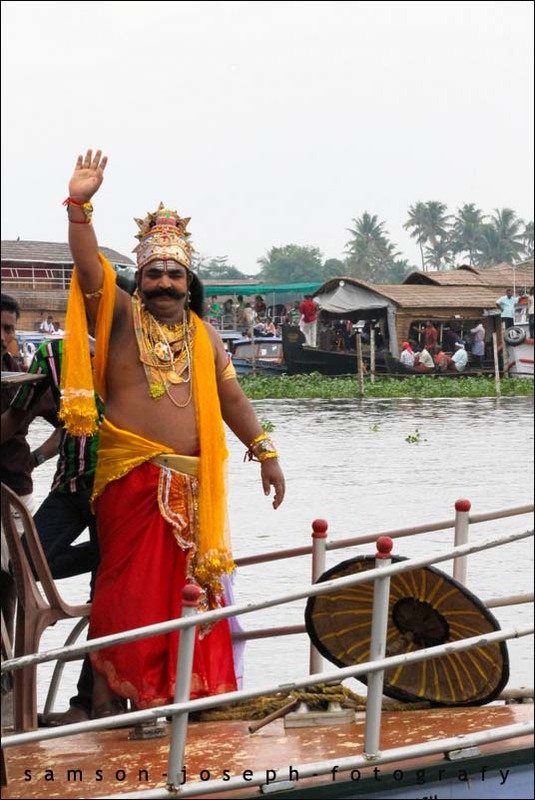 I had been to Alappuzha and had also taken a house boat ride before, so this trip to Alleppey was not about the house boat and the flourishing tourism that is tangled with it but rather to witness the biggest celebration of Alappuzha, the Jalolsavam – festival of waters – the snake boat race! 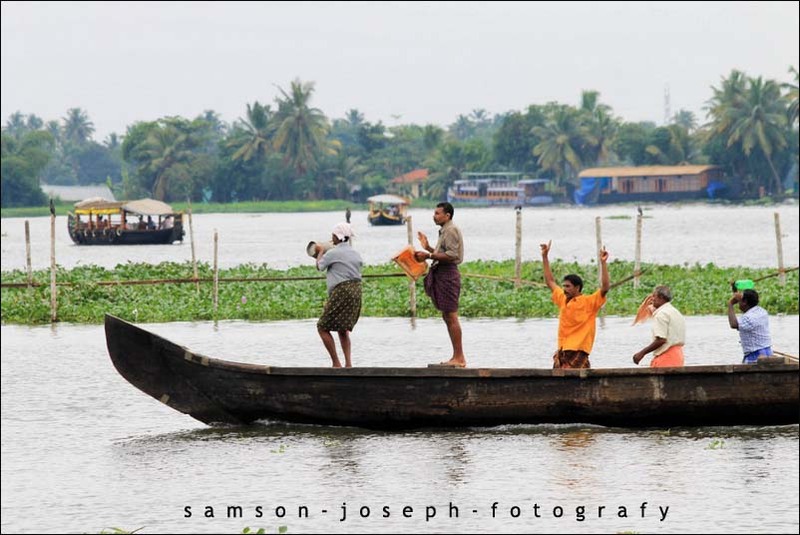 On the eve of the celebrated vallamkali or boat race, I arrived at Alappuzha and without wasting much time, hired a small canoe to go around the backwaters, more importantly into the heart of the villages that lay amidst these waters. A canoe could go into where the house boat could not. A houseboat is for those laid back holidays on the waters but if one would want to sway in the vibes of the kaayal then canoes or shikharas as the locals call it are the best bet. Moreover these canoes are rowed manually and hence no pollution like those caused by the huge generators on house boats! The boat jetty near Alappuzha bus stand has many such boats and oarsmen waiting for tourists. As I struck a deal and settled in for a ride, it was around 2pm and the canal that leads into the kaayal was bustling with activities running to the vallamkali that is due to take place the next day. It seemed like the canal was busier than usual. Organizers and localites preparing various boats and other equipments for the event, many other canoes & boats that were ferrying tourists, the speed boats of police department keeping an eye on the proceedings, the huge boats of water transport department conveying local people between the Alleppey town and the villages in the backwaters, it was all happening there. 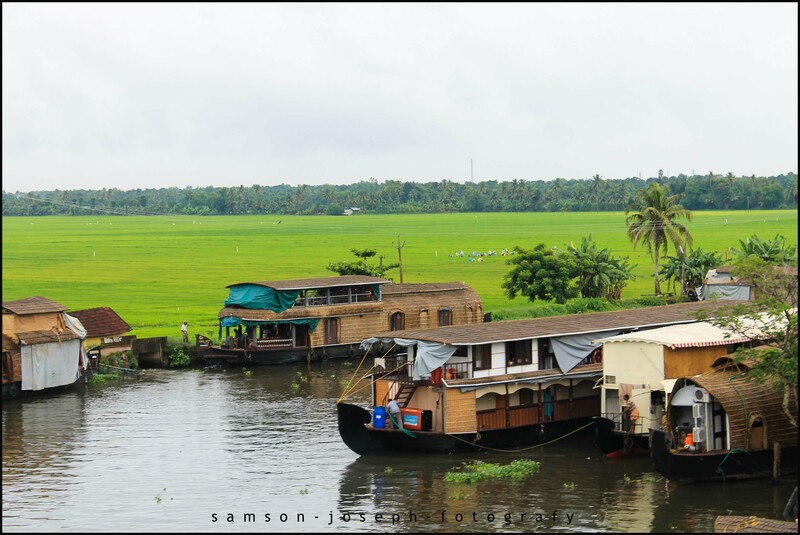 Kuttanaad, the prime village in Alappuzha, forms the heart of the backwaters along with many other small villages. Anything and everything begins, revolves around and ends with water here! 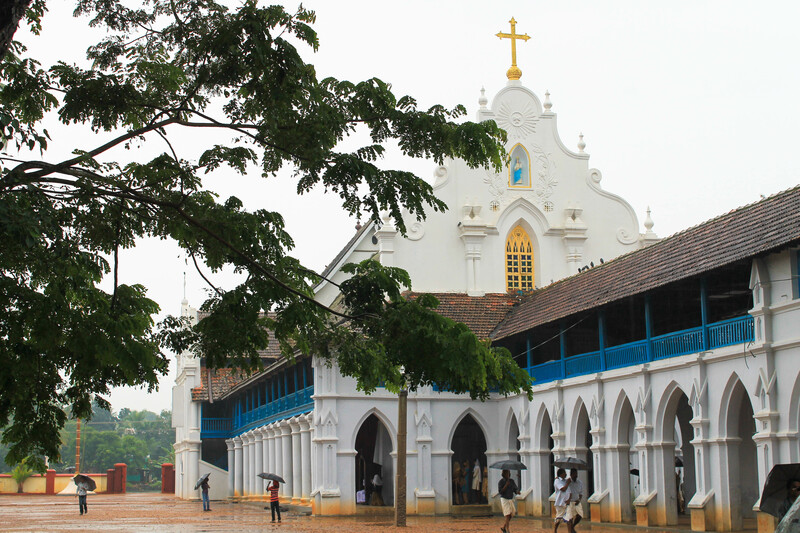 Bright colored houses, schools, churches, temples, grocery sold on boats, fish and meat stalls on boat and few restaurants off late to cater to the increasing number of tourists, the shores of the backwaters are engrossed in activity anytime. We sailed out of the canal into the vast backwaters. 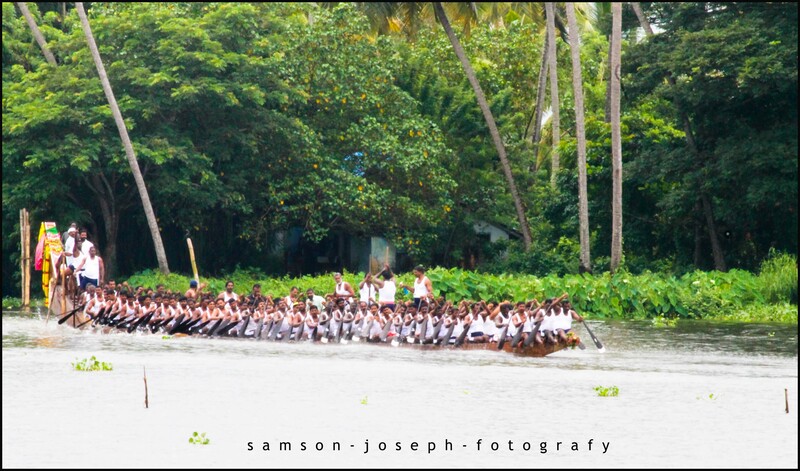 At the point where the canal joins the backwaters was the finishing point of the boat race that is to happen the next day. There was a huge pavilion thronging with more advertisement banners than people! Adjacent to it were the tracks in water, four of them laid and marked with flags and numbers at the end point. There were seating arrangements being set up on the left bank and few people on the boat clearing the weed and other plants off the track. Small boats were doing the practice rounds, many others preparing their boats and gearing up. The shores were a hub of activity. There were school children returning early from their schools and villagers hurrying up to finish their chores. Ladies washing vessels and clothes in the waters and fishermen giving their last try before the big day. The temples and churches on the shores were all decorated. 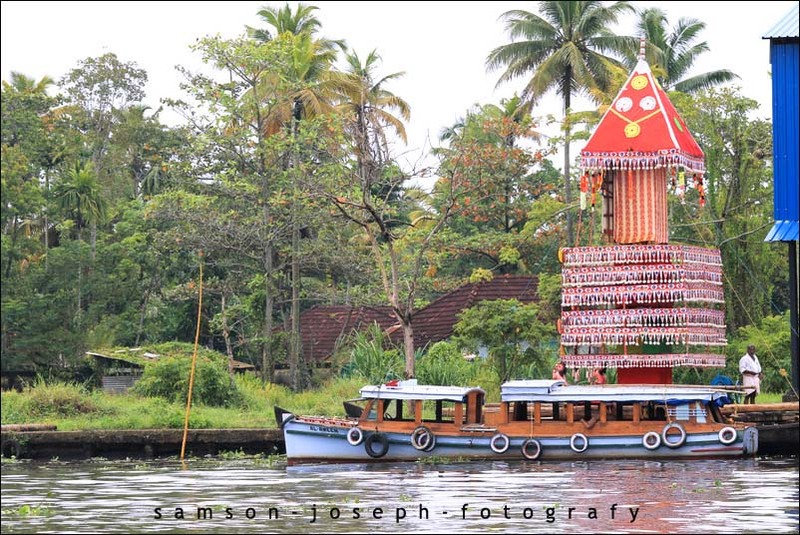 Kuttanaad – the backwater village – was all brimming with color and festivity. 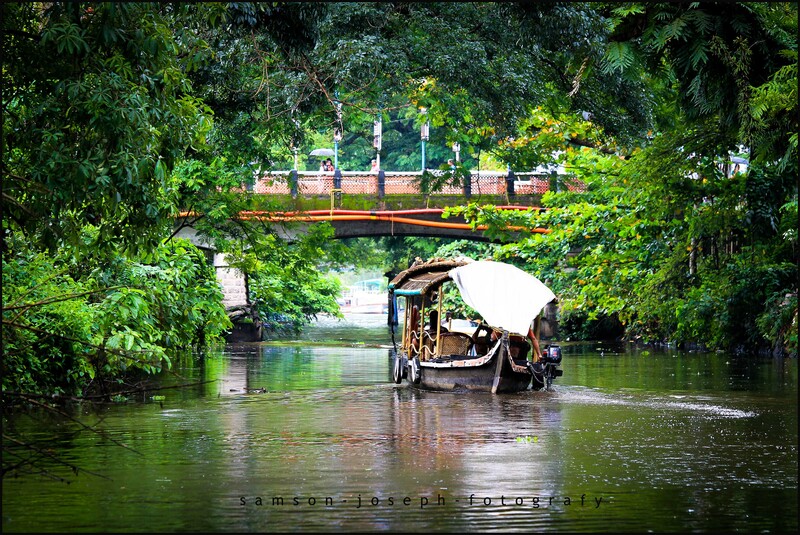 After a lazy boat ride for few hours on the swaying greenish waters, we returned to the city junction. The city was decked up with hoardings, barricades, banners and welcome signs. There was a cultural event that was happening at one of the auditoriums to which we arrived late and cursed ourselves for missing the folk song performance. An amazing musical performance followed and we returned to our hotel late in the night waiting for the big dawn! Here it was! The sun had risen on Alappuzha all set to witness the show of waters yet again! The race was due to begin at 2.30 pm and hence we decided to make the most of the first half of the day. To all of you who have watched the Tamil movie Vinnaithaandi varuvaaya, the church at which the wedding takes place needs no introduction! We didn’t know anything about it apart from the fact that it was in Alleppey. We enquired with many people and got into a local bus very early in the morning and headed towards the church that had featured in few famous South Indian movies. But after an hour of bus journey sadly we ended up at another place, in front of a church that looked relatively new! We walked into the church compound in disappointment but much more significance awaited us at this church. We were at The Kalloorkkad church, built as early as 427AD and closely associated with the apostle St. Thomas himself. The church had the typical Portuguese style of construction with high façade and columns on the sides. Holy mass was being offered as we entered the church. It seemed like a time travel! The interior was almost intact for past 1585 years except for very minor changes. High ceilings that had some amazing paintings on them, A glorious altar which still carried its yester year charm with all metal coverings and idols of various saints and an interior that was way far from what could be seen in the modern day churches. It was antiquity at its best, probably the oldest structure I have ever come across. The exteriors of the church were rebuilt from time to time to preserve the structure with the interior retaining its charm. Taking part in the holy mass in such a place made me get goose bumps. On the other side of the church flowed the River Pampa. We were told that a boat ride across the river would take us to another village from where we could get a bus to Alleppey via another route. We gleefully took the offer and also the boat ride. Another bus journey through some of the best landscapes I have ever seen followed. Cutting through lush green fields, canals, water bodies and a bridge that overlooked all of these with house boats dotting the river under, we got back to Alleppey. The city junction had got more and more busy now. We quickly collected our tickets to the stands and after a filling breakfast, walked towards the stands along the backwater shores. The mood was set already! People were flowing in as early as 10.30AM for a show that was scheduled well past mid noon. The excitement was clear and loud. The stands and seating were full and foreigners were in abundance along with localites. We chose to go into the open stands leaving aside the comfort of our chairs. The celebration was surely out there in the crowd with localites all set to cheer and celebrate the chundan ¬– the snake boat that they supported. 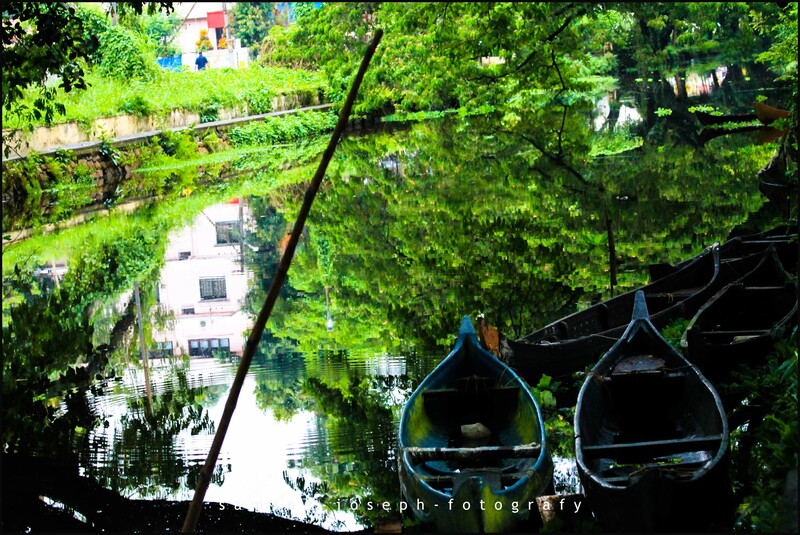 Punnamada kaayal – the backwater had shed the calmness and serenity that it usually wore. The coconut groves that flanked on either side seemed to be swaying to the tunes of chenda melam – the drum beats. The ripples that waved to the rhythm of breeze that mollycoddled them now seemed to be singing along with the… ♪♫ thi thi thaara… of vanjipaattu – the folk song of boats. There was a maddening crowd that was waiting for the race to begin. Some of the youth even jumped into the water out of excitement. The crowd grew bigger and bigger as the time passed by. At 1PM, it got really difficult to manage ourselves in the hustle. The banks were crammed up and we were luckily holding onto an iron fence without which we would surely be in water! Small tussles and fist fights seemed common as the crowd got bigger. There were instances on which some of the drunken spectator picked up a fight and pulled 3-4 of them into water! But it all seemed to be part of the big day for the crowd of Alleppey. At sharp 2pm all the boats came rowing into the main pavilion for the inauguration and oath taking, after which a mass drill session followed. Thousands of oars in air and ten thousands of supporters at top of their voice, sight to behold! We could hear the supporters cheering their teams, predictions and analysis all happening. 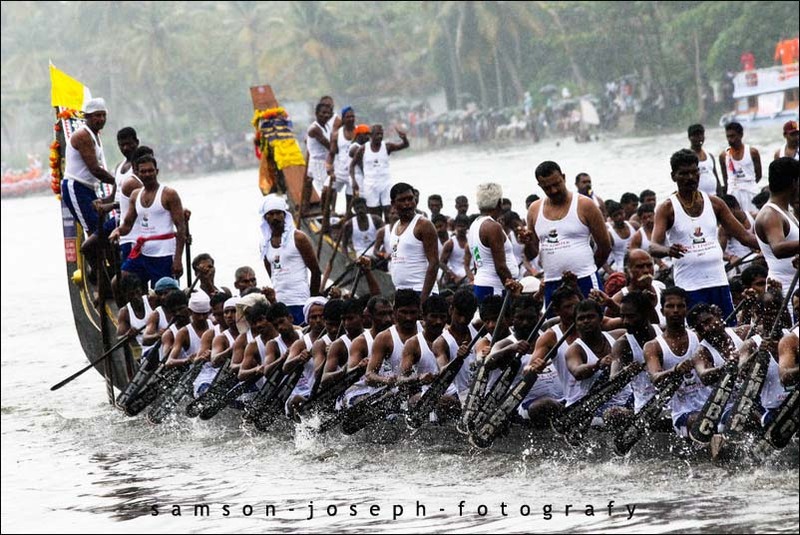 The chundan vallams, with its 100+ crew rowed back to the starting point. The start of the race was announced by the steamers zipping past the tracks with white flags making sure the tracks were clear! The fans and the spectators now pushed ahead. 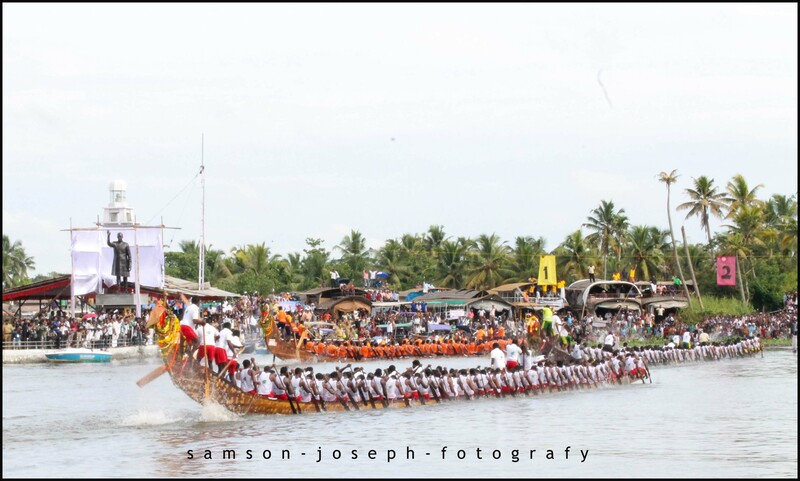 The ecstatic cheers of aarpoooooo… irrrooo.. filled the air of Punnamada Kaayal and there it was, 4 chundan vallams, with over 100 oarsmen on each rowing in unison to the tunes of vanjipaattu sung by their crew, racing past one another to the finishing point 1.3kms ahead! A view that exhausts superlatives without doubt! The first heat of the race was as good as a final! The boat that was at third place half way down the track, rowed into victory edging out those on track 1&2 which were fighting for the finishing point! A show of one of its kinds with sheer guts on display! The crowd now got uncontrollable and we were at the risk of being pushed into the water. If I did not have the camera then I would have happily taken the risk but couldn’t now! So we waited for all the heats to get over and return! And the next four races did not come up to the excitement created by the first, they were all one sided! We decided to depart as it got very riskier to be there anymore and also we had a train to catch in the evening. As we walked away from the stands half heartedly the loud cheer could still be heard! 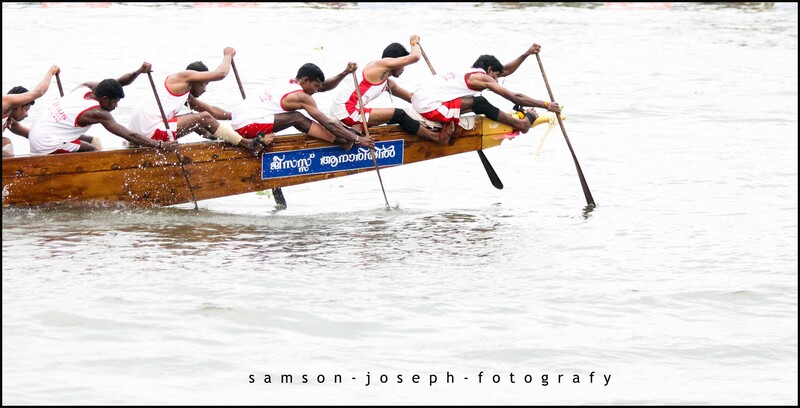 But we had watched one of the best races and as we boarded the train from Alleppey railway station, I was returning with a content feel of having witnessed one of the most celebrated races in the world and to have achieved one of the tasks on my Bucket list! absolutely amazing photos and of course the accompanying text. I know how long it takes to do this kind of thing and really appreciate your sharing as you do. and I am glad you are back! On my blog and in India too! 🙂 Bon Voyage! It is so refreshing to read your blogs. wonderful writing and loved your photos. thoroughly enjoyed reading. Keep up the good work. Looking for many more such writings from you. Thanks a lot, Prarthana 🙂 I am glad you liked it and enjoyed reading. Welcome to the Trippin’ !!! and btw ur name, Prarthana, has a lot of significance in my life! 😉 nice name! That’s a large hearted comment, Prarthana 🙂 overwhelming & inspiring enough to write more! niceee… thanks for dropping in! thanks to ur friend too! Thank you for visiting my blog. Your photograph tells a life and culture of India well. I am looking forward to it. Thanks a lot!! Welcome to the Trippin’!!! 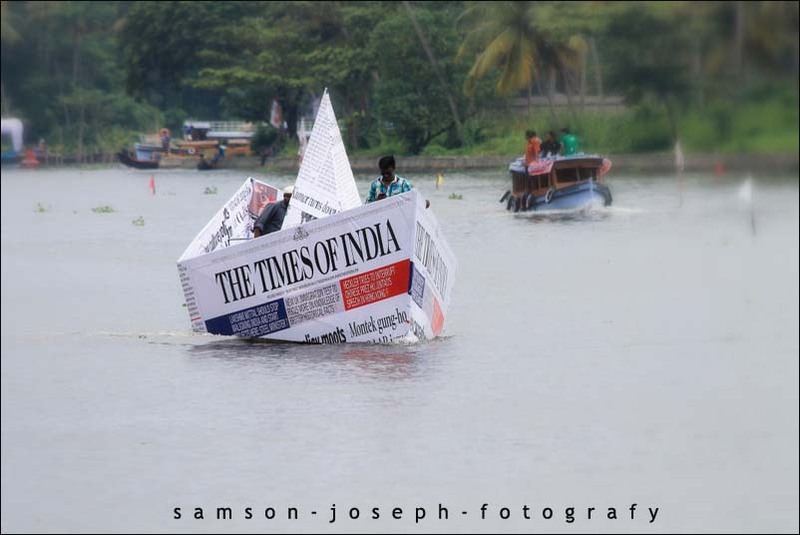 You are very much right about the newspaper boat! There was another major newspaper who was campaigning with mere loudspeakers, needless to say that nobody spotted their advertisement after this one arrived! Hi David, thanks for your nice words! I am glad it inspired you! 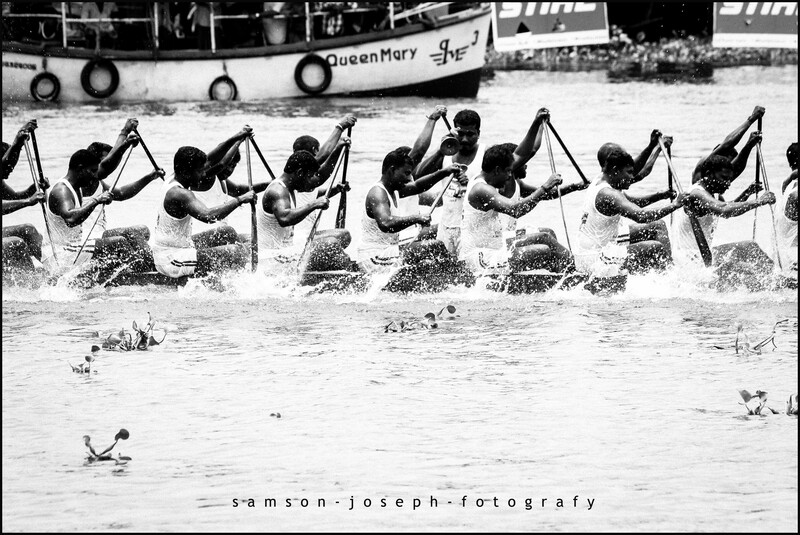 the Nehru trophy, biggest of these races, takes place on second saturday of every August regardless of weather and date! but you have found a brilliant website here, I am sure there are plenty of other Vallamkalis as well! Aranmula and Champakulam being the best of the rest! Thank you very much, Angela 😊 u should plan a trip next year!